205 Sept. 1943 - Treasurer's Report. W C T U Report for year beginning 1942 to year ending Sep 1943 Assets 97.30 Disbursements 88 10 Balance 9.10 48 members 5 new members this year One died since joining 4 died thru the year 2 paid up for next year 1943-1944 Edna Sherman and A. 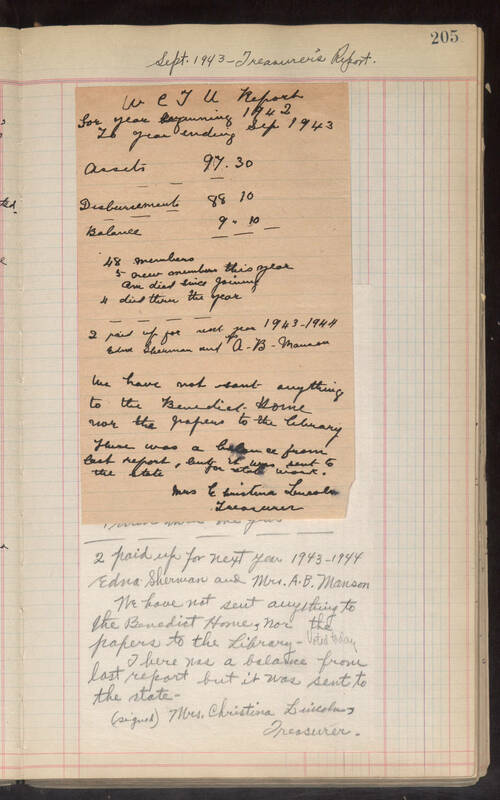 B. Manson We have not sent anything to the Benedict Home nor the papers to the library There was a balance from last report, but it was sent to the state for state work. Mrs Christina Lincoln Treasurer 4 died thru the year 2 paid up for next year 1943-1944 Edna Sherman and Mrs. A. B. Manson We have not sent anything to the Benedict Home, nor the papers to the Library. Voted today There was a balance from last report but it was sent to the state. (signed) Mrs. Christina Lincoln, Treasurer.